I’ve got another great Valentine’s Day Gift Idea for you! If your not into the flowers and candy how about a perfect cute and compact place to keep her jewelry. 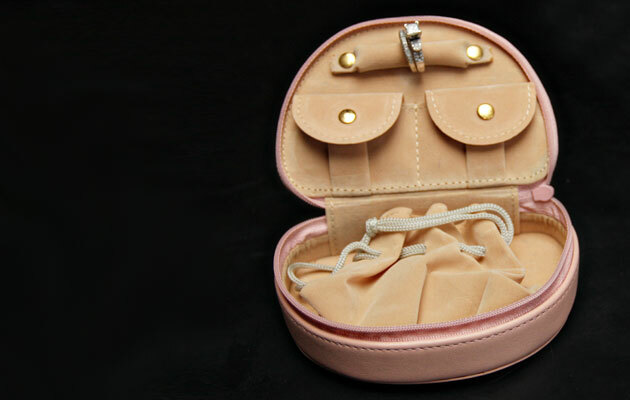 The Royce Leather Mini Jewlery Case is perfect for holding all your jewelry and would be great to bring on trips. It is made with top grain Nappa leather – it’s such a nice quality leather and so soft. The Mini Jewelry Case may be small and cute but inside there is a place for everything. I wear jewelry everyday including my engagement ring and wedding band so when we travel I have to have a safe place to keep it all. The ring bar securely holds my rings by sliding the ring on the bar and snapping it into place which will prevent your priceless engagement rings and wedding bands from getting jostled around or worse, lost. The two snap pockets are great for holding your bracelets or chains and if you have larger jewelry it also comes with a drawstring pouch that can be removed. I like to use the drawstring bag for my watches. The pouch also velcros down which I like because it makes it less easy for it to get misplaced. The inside is made of a nice soft material that will prevent all your fine jewelry from getting scratched. The Royce Leather Jewelry case is not only functional but it’s super cute and it comes in a variety of fun colors including Black, Burgundy, Green, Red, Tan, Carnation Pink, Key Lime Green, Ocean Blue or Wildberry. The case I have is Carnation Pink and it is a really soft pale pink which I think would be great for Valentine’s Day! To make it even more special you can add personalization add her name or maybe even a special little message for her. 🙂 I had a little “A” put on mine for our last name on mine! If your a business owner, Royce Leather can also emboss your company logo. Royce Leather, proud producer of fine leather items since 1974, prides itself on superior leather, expert craftsmanship, and affordable pricing. Royce Leather incorporates a classic, well-designed product with rich character, enduring quality, and the unique beauty of each leather hide. The leather skins are carefully hand selected, inspected, and finished with pride by skilled craftsmen while they maintain the natural beauty of the leather. Each piece is meticulously constructed with attention to even, fine stitching, and is tooled using only the finest techniques and materials. The finished Royce product can withstand the tests of time and travel for both a busy personal and professional lifestyle. Royce Leather Mini Jewelry Cases are available for purchase at www.royceleathergifts.com for $33.00. Royce Leather Collection is giving one of my lucky readers a Mini Jewelry Case! To enter fill out the Rafflecopter form below. Ends 2/24 at 11:59PM EST. I received a Royce Leather Mini Jewelry Case for the purpose of this honest review. All thoughts and opinions are my own. This post was written by me and not edited by anyone. I would love to have the ROYCE LEATHER CONVERTIBLE ZIP AROUND PADHOLDER 748-5. I want the iPhone leather case! I reallly like the nook case. I like the 740-5 ROYCE LEATHER MOUSE PAD in black. I like the ROYCE LEATHER HANGING TOILETRY BAG 264-5. I would love to have the ROYCE LEATHER DELUXE COMPUTER BAG 644-5. I’d love the Royce Leather iPad1 & iPad2 Case! I would love to have the ROYCE LEATHER TOILETRY BAG WITH REMOVABLE POUCH. I like the Royce Leather Mousepad, wish it came in Pink! I’d like to have the 254-5 ROYCE LEATHER TOILETRY COMBO GROOMING SET.